Divided into two parts - a strategic business commentary and a practical toolkit - Purchasing Power is an essential read for any senior executive looking to achieve maximum profitability and enterprise value. This book is about re-creating in mature companies the high-performing behaviours that they exhibited when they were young. In pursuing this aim, the procurement process is advocated as one of the central value creators in business. But it's not just about cost management and the bottom line. Strategic purchasing can impact on the top line by stimulating revenue growth; can enhance internal productivity; can facilitate the management of cash; and can manage supply risk and supply chain vulnerability. The book has recently been reprinted and, as at February 2004, supplies are available. "One of the biggest sellers of recent months has been Purchasing Power. Clearly this book has something that other books on purchasing do not have. 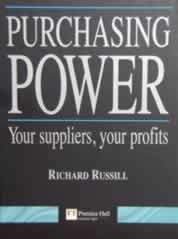 Perhaps the key lies in the second part of the title "Your Suppliers, Your Profits"
"Top of my list is Purchasing Power. Like many of his works Russill focuses as much on the organisational challenges of implementing purchasing strategies as the process of strategy creation itself." "This book challenges many of the values and attitudes which managers and shareholders see as fundamental to business success. It is challenging and provocative in an unconventional way."